Surreal realities often refers to a term when a reality is like a hallucinatory quality of a dream, which seems unreal (Urban Dictionary). Each individual faces his/her own reality in different ways and attitude. For artists, they often create their own world in their artworks which contains their interpretations of things that matter to them in their realities. It is the underlying truth and state of mind expressed in coded messages by images, ideas, strokes and forms, etc. 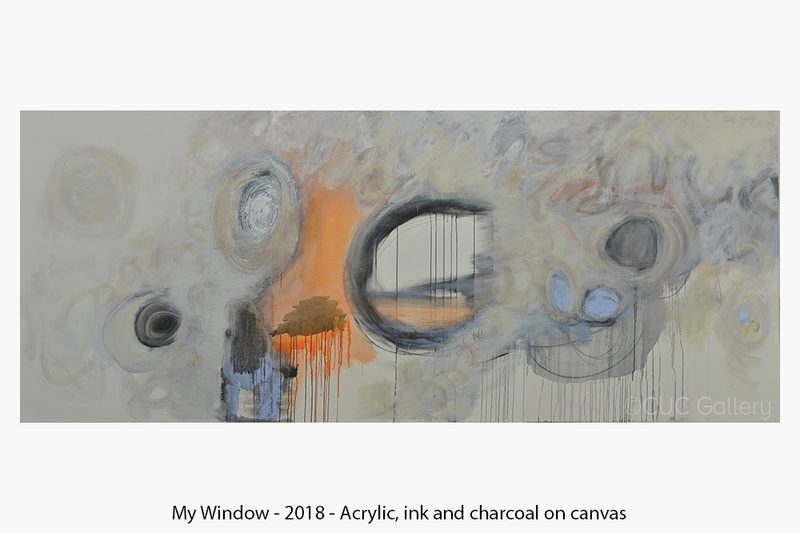 While the exhibited works may range in style and medium, each refers to the obsessive impulse of creation of a dreamlike, subtle and unreal state of mind that one has gone through. Nguyen Trung (b.1940) is sometimes referred to as the Father ofVietnamese abstract art, a founding member of Young Artists Association, a vanguard art group in Saigon established in 1966 and remained active until the momentous political transformations in 1975. He is the most respected and senior artist of Vietnam, turning abstract art into historical importance. His works now can be seen in many private and public collections such as Vietnam National Fine Art Museum (Vietnam), Hochiminh Fine Art Museum (Vietnam), Singapore Art Museum (Singapore), Museo Biblioteca Archivio (Italy), United Overseas Bank (Singapore), etc. Do Hoang Tuong (b. 1960) from Quang Nam, moved to Saigon in 1970. Tuong is one of the most prominent contemporary figurative artist of Vietnam. He attended Saigon College of Fine Art in 1976 and then Hochiminh University of Fine Art in 1979. One of his most important and well received exhibitions was in 1988, becoming his stepping stone of his art career. In 1988 and 1989, following his senior artist Nguyen Trung, Tuong was inspired by nouveau art and participated in the young artists group. This marks the very exciting period of Vietnamese art history. In 2017, Tuong participated in group exhibition "Vietnam in Venice" with other 4 fellow artists in Venezia, Italy during the Venice Biennale 2017. In 2018, Tuong is selected to represent Vietnam in the Phillipines’s exhibition Ties of history: Art in Southeast Asia to conclude the commemoration of ASEAN 50th anniversary. Nguyen Truc (b. 1969) born and raised in Hochiminh city, graduated from Hochiminh Fine Arts University. Since 1996, his works got selected for Phillip Morris Award exhibition. From the on, Truc has diligently and silently worked on mostly abstract paintings. His interest in photography also creates a balanced experimentation of forms and mediums. His works always evokes a sense of time, history and fragments. This is something very difficult to grasp, intangible yet very easy to relate to when looking at his works. Ly Tran Quynh Giang (b. 1978) is best known for her oil painting and wood cut panels. Born, raised and living in Hanoi, graduated from Hanoi Fine Art University, Giang is one of the most prominent female contemporary artists of Vietnam. She is an artist whose representations of human and animal figures exude a range of emotions and sensations: sadness, melancholy, ennui, uncertainty, intimacy, intensity, and eroticism. Her important exhibitions are Where they turn to (2014), Hey are you sick (2010), The solitary world of Ly Tran Quynh Giang (2010), Giang (2007), Tropical zone (2002). Her most recent exhibition is Personal Structures - Vietnam in Venice with other 4 artists from her represented gallery in Venezia, Italy. In 2017, her 2 works got featured in Rekindling Lacquer: Vietnamese Mordern Painting in Shanghai Collections, China Art Museum, Shanghai. Nguyen Van Phuc (b.1978) is among the top emerging Vietnam new generation of artists. Born and raised in Hanoi, graduated from Hanoi Fine Arts University in 2003, Phuc has set a very distinctive artistic direction from the rest. He often paints different characters in a very unfamiliar background with a hint of humor. Using very vibrant colors and topics of everyday life, Phuc depicts his own world of psychological struggles with social changes and contexts of Vietnam in the new era. His 2 works was selected to exhibit in Salt of the Jungle of the Korea Foundation in 2018.